Kayla Kyle (September 18, 2018) We are still amazed…I mean you should’ve seen my hubby before…I wish I had before and after pics LOL he always had tears running down his face, red swollen eyes, sounded sic and congested; he was miserable for like 4 months & after a week on your honey 100% better!! Thanks you!! Kayla R. (September 1, 2018) So Kyle has been suffering from allergies for a few months, trying everything from meds to homeopathic drops, colloidal silver , claritin, zyrtec, you named it we tried it & got little to no relieve ! Someone mentioned to try local honey ? ? ? ? So I decided to get some for him to try, it couldn’t hurt right?! So I bought some sourwood local honey from Sharry Patton Mikell & in just a few days his allergies are doing so much better! Plus it’s the best honey we’ve tasted! I definitely recommend ! ? . Gabrielle O. (June 16, 2018) Sharry is awesome! My company recently ordered a few items for a client of ours. She went above and beyond when it came to customer service as well! Becca S. (December 20, 2016) This one is my favorite soap of all time. I can’t believe the difference in my skin since I switched to all natural a year ago. LOVE LOVE LOVE!!!! Steve L. (December 23, 2016) That tested and certified 94% pure sourwood honey was the absolute best honey I have ever tasted!! Thanks to Doug and Sharry at Mikells’ Farm Honey for this marvelous “liquid gold” honey!! Nancy N. (October 4, 2016) Get this honey 2 or 3 at a time, OMG this honey has the best taste, and I have seen where it is made. I have never had better honey. Jessica Q. (May 15, 2016) We tried your honey yesterday and bought some as gifts. We will be returning customers. Cleo H (May 13, 2016) Great products! Elaine M (May 17, 2016) Your honey is the best I have ever tasted! Samantha D (May 12, 2016) Awesome products honey taste so good. Judy P (Dec. 8, 2015) Lot’s of lovely products! I stopped by (a festival they had a booth at) yesterday and fell in love! Angel A – (November 24, 2015) (From Florida, using our Sourwood honey in his BBQ Sauce.) I got the pork shoulders ready for the smoker. Can you identify the secret ingredient? It comes straight out of North Carolina , On Mikells Farm. Thanks to Doug and Sharry. 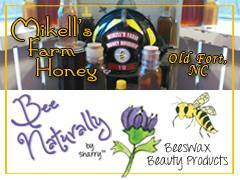 Val M January 12, 2016 Received some honey and lip balm from Sharry Patton Mikell from Bee Naturally by Sharry….it is the best honey I have ever had and the lip balm was an instant hit with me! If you want some great stuff go to Sharry’s Web site…you will be amazed at the flavor! Thanks Sharry! Rita M January 2, 2016 We are loving and enjoying our bee naturally products, miss sharry! that bar you included is fantastic! the aroma was sneaking out of the closed packaging (yum). keep up the good work! Betty M. Dec. 2015 – My teenage granddaughter requested your Lip Balm for her Christmas present! She loves it! Ron S – November 14, 2015 Best honey I have ever tasted. I shipped all over the US and outside as gifts! Susan H Oct. 1, 2015 They are great products and I use them every day. You should be very proud! I would like to order 4 more Garden Hand Salves. Do you still have the 2 ounce size? My husband is hooked on it too!